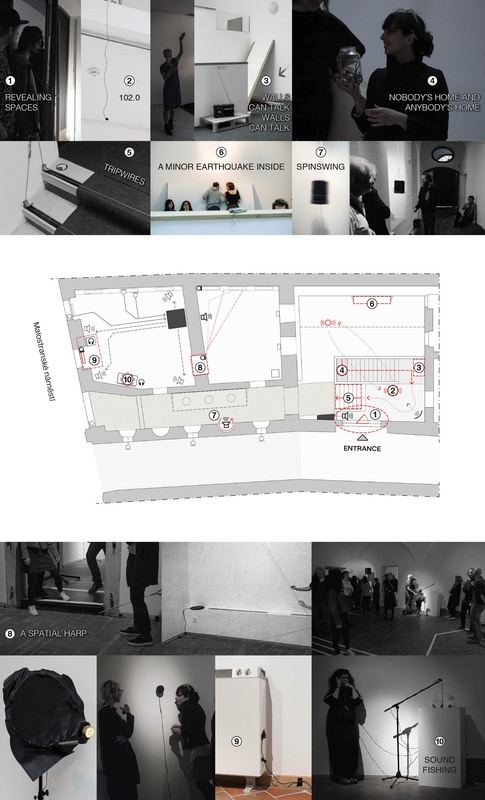 Waveguides is a sound installation developed specifically for Gallery AMU. It explores the concept of wave-guiding architecture in relation to spatial perception. 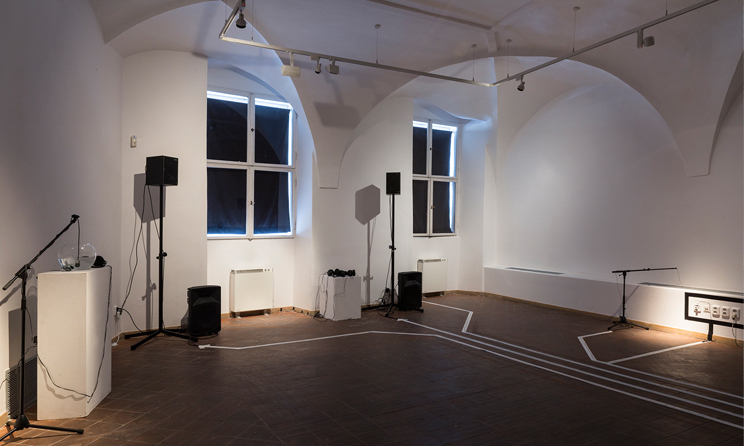 For that purpose, the gallery is occupied with different microphones, loudspeakers and other electroacoustic technologies, turning the space itself into a listening circuit. Additionally, other materials articulate a path of physical vibrations, situating the visitor within an acoustic labyrinth: the space is re-wired, re-channeled, re-connected into an acoustically modified arrangement. The sound waves on site construct new relations with surroundings and ears. 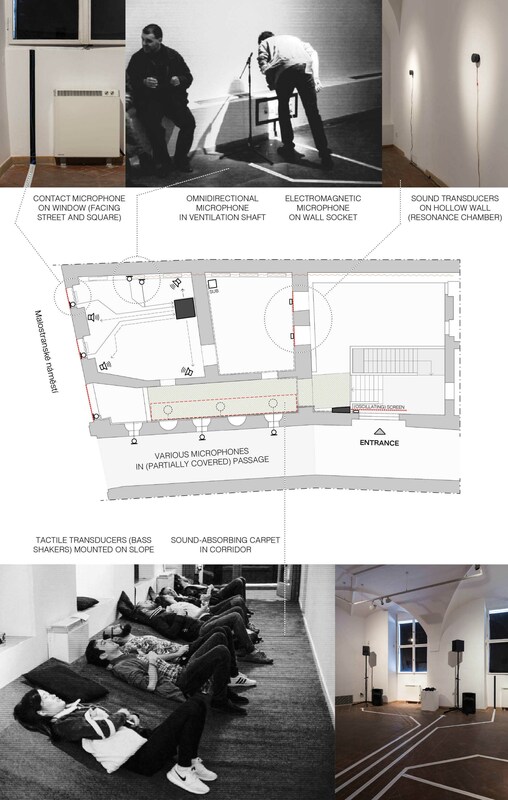 The lecture From Inner Ears to Other Spaces discusses the relationships between the social practice of listening and (electro)acoustic architectures. It explores waveguides in relation to different conceptions of space and time. Technically, a waveguide is a physical structure (tube or solid) which directs sound or electromagnetic waves and minimizes the loss of energy by restricting the expansion to one or two dimensions. In other words, it confines the direction of sound propagation. This amplifies the reach and modifies the ways in which we experience and conceptualize space and time. We opened the exhibition to other artistic interventions during the course of a 5-day workshop. Participants were asked to develop their own site-specific work, which was presented at the second opening (part B). Text by curator and artists. Special thanks to Eliska Zakova (GAMU), Jiří Rouš, Jitka, Michal Cáb, Brona, Matej Senkyrik and workshop participants (see part B below), and indirectly the Institute of Sonology. Photos by Oskar Helcel, Erika Štěpánková. Supported by the Ministry of Culture Czech Republic, Center of Audiovisual Studies FAMU and the Department of Composition HAMU, Prague. Sound excerpts will be added soon.